You are here: Home Forum Home Main Forum New to me 1960s pacific Mariner HP rating? New to me 1960s pacific Mariner HP rating? TOPIC:	New to me 1960s pacific Mariner HP rating? 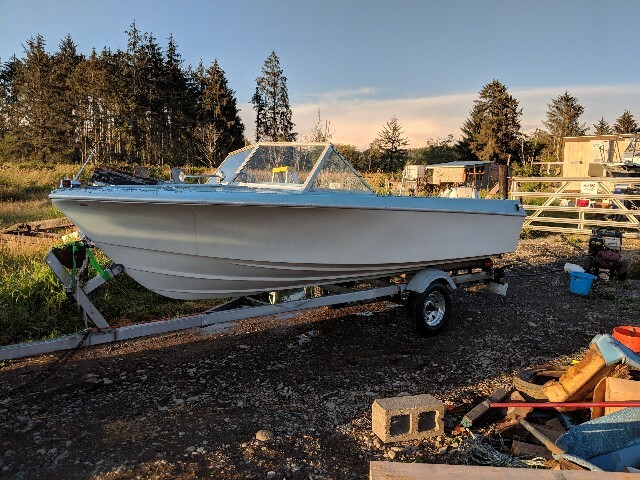 I just got a beautiful 1960's 16' pacific Mariner "BOLO" it has a 1961 Johnson 75 hp seahorse on it that hasn't been ran in 15+ years. Lower unit is out of our, and top end is possibly stuck.. I may just repower it with a newer (80s+) 2 stroke but would like to know the maximum HP rating the boat has. There is no plate that I can find listing it. According to the brochures it's 50hp. Keep in mind that 58 years ago those motors were heavier and clumsy. Today's newer motors might get you up to the HP you want but be careful what you wish for, some of the older designs weren't meant for too much speed. Go to the top of this page and click on "Glassic Library" and then scroll down to Pacific Mariner. There are pages of the '61 brochure. Would like to see some pictures of your find. Also older motors rated hp at the crankshaft. Newer motors rated hp at the prop shaft. The experts can tell you what year that transition happened. Also an older 75hp 4 cylinder likely weighs more than a newer 3 cylinder 75... which all effects performance. As 63 Sabre said... maybe donât want to push it too much faster than design. Itâs a balancing act. Good luck with all. Nice. Looks really clean from the picture. After 5 hours of pressure washing the 15 years of moss off And removing the totally rotten seats, yeah she looks good.